To keep your PC more secure and reliable, you need to configure and keep its security features such as firewall, antivirus, Windows policies, user accounts, privacy settings, etc as it should be. 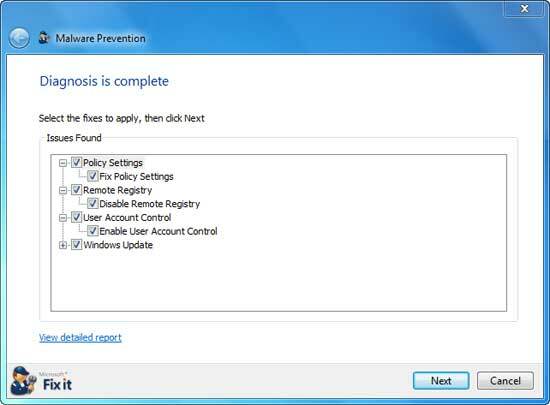 Here is an automated solution to diagnose and fix common security setting on Windows. Checks Windows Firewall configuration and repairs as needed. Checks Windows policies to determine bad settings in the Windows Registry. Checks Internet Explorer privacy setting to determine how cookies are handled. Checks Windows Update to ensure computer is kept current and secure. Resets Remote Registry back to default to prevent remote modification. Resets User Account Control to default to prevent unauthorized changes to computer. Clears Internet Explorer history and cache. Checks if Internet Explorer is up to date.